Google announced Wednesday it was bringing its digital assistant to Apple iPhones as part of its effort to win the battle with tech rivals on artificial intelligence. 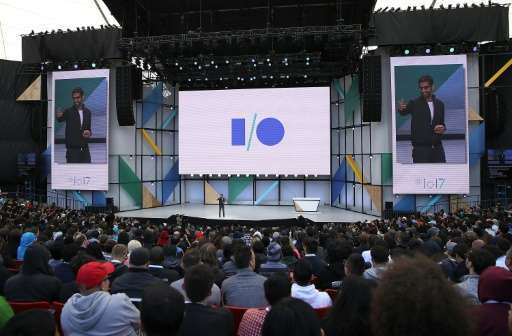 At its annual developers conference at an outdoor concert-venue near its main campus in Mountain View, California, Google unveiled its vision for computing centered around artificial intelligence. "We are now witnessing a new shift in computing: the move from a mobile-first to an AI-first world," Google chief executive Sundar Pichai said during an opening presentation. "It is forcing us to reimagine our products for a world that allows a more natural, seamless way of interacting with technology." Those interactions, for Google, include using artificial intelligence to let people engage computers conversationally, have software anticipate needs, and let smartphone cameras "recognize" what they see. "In an AI-first world, we are rethinking all of our products and applying machine learning to solve problems," Pichai said. Google Assistant, the center of its AI efforts, is in a fierce battle with rivals such as Amazon's Alexa, Microsoft Cortana and Apple's Siri to be the top choice for use in smartphones as well as connected homes, cars and a range of other devices. Artificial intelligence is being woven into Google's free Gmail service, used by more than a billion people, for features such as suggesting responses to messages. For example, opening an email containing an invitation to dinner might trigger a prompt to reply "I'm in." Google machine vision capabilities are being used to enable services such as recognizing who is in pictures and what they are doing as well as translate languages in signs viewed through smartphone cameras, demonstrations showed. Advanced "Lens" features are being added first to the Google Photo application, which is available free. Aiming a smartphone camera at a flower will prompt it to be identified; while aiming it at a complex password and hotspot name on a router will let it automatically log into the wireless connection, demonstrations showed. Google also unveiled a second-generation computer chip it designed specifically to improve cloud computing capabilities in data centers. "We want Google Cloud to be the best cloud for machine learning," Pichai said. He described the internet giant's core search service and its Google Assistant as the company's most important AI products. Google Assistant, introduced last year, is now on more than 100 million devices, according to the team's vice president of engineering Scott Huffman. "We are really starting to crack the hard computer challenge of conversationality," Huffman said. "Soon, with Google Lens, your assistant will be able to have a conversation about what you see." Google used the conference to announce a software kit that will let developers build Assistant capabilities into robots, applications, and other computerized creations. Google also announced enhancements to its Home personal assistant, adding abilities such as hands free telephone calls and acting as speakers for wireless audio. Developers cheered when talk turned to Google-backed mobile operating system Android. Google announced that more than two billion devices powered by Android software are used monthly in a freshly passed milestone. The coming version of Android, referred to simply as "O" for the time being, will also have boosted artificial intelligence features along with enhanced security, executives showed. Google is also crafting a lighter version of Android, referred to as "Go," designed for maximum performance on low-cost, entry-level smartphones in developing countries where internet bandwidth is lean or expensive. Google said that while it is happy with the momentum of its Daydream virtual reality platform based on using smartphone as screens in headsets, it is working with partners on stand-alone virtual reality gear. Partners in the endeavor include Vive-maker HTC and Lenovo, according to Google virtual reality team vice president Clay Bavor.